To urge all 53 Commonwealth Heads of Government to adopt an anti-slavery agenda at the 2018 Commonwealth Heads of Government meeting in London. 55% of people living in modern slavery reside in Commonwealth countries, which means that the Commonwealth as an intergovernmental body is in a unique position to develop anti-slavery policies across its member states that can drive progress in ending modern slavery and human trafficking. Freedom United launched this campaign in November 2016 with our partner, Commonwealth Human Rights Initiative, and we have since collected 65,351 petition signatures of a total 84,282 actions. Our supporters sent 6,325 messages to the Secretary-General of the Commonwealth on Commonwealth Day in 2017 and over 11,000 messages to the Malaysian Prime Minister calling for his support as the future Chair of the Commonwealth. As a result, we received a statement of support in 2017 for action to end modern slavery from the Commonwealth’s then Chair-in-Office, the Prime Minister of Malta. Our petition signatures were used by Commonwealth Human Rights Initiative in Commonwealth meetings and seminars to power their message and let the Commonwealth know just how much global support there is for ending modern slavery. This campaign has come a long way, considering the word ‘slavery’ had not been uttered publicly in a Commonwealth setting when we began speaking out. A year and a half and over 65,351 signatures later, we handed in our petition to the Assistant Secretary-General of the Commonwealth just before the Commonwealth Heads of Government Meeting. Success! 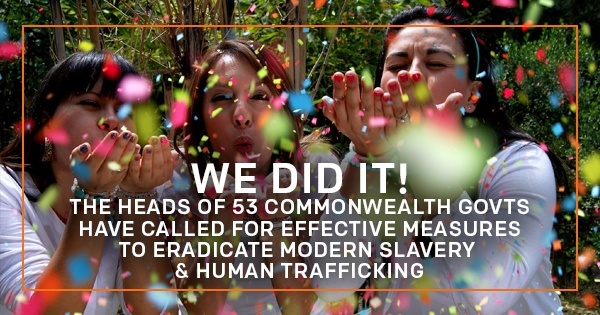 In April 2018, the Commonwealth Heads of Government heard our call and finally committed to taking effective measures to end modern slavery and human trafficking. The Commonwealth’s Communiqué released at the end of the meeting said: “Heads called for effective measures to eradicate forced labour, end modern slavery and human trafficking, and secure the prohibition and elimination of the worst forms of child labour in all its forms by 2025” mirroring our call set out in our petition. We are delighted by the commitment expressed in the Communiqué and with their call to action, the potential for creating a world in which slavery no longer thrives is enormous. 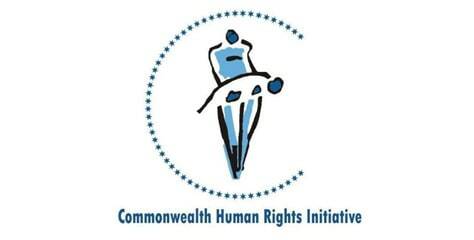 The Commonwealth Human Rights Initiative (CHRI) is an independent, non-partisan, international non-governmental organisation, mandated to ensure the practical realisation of human rights in the countries of the Commonwealth.